It’s been an amazing journey – this blogging thing. I’d been doing family history research for about twenty years when I took up Amy Johnson Crow’s challenge to write about my ancestors. It took me until week 3 to decide to start a blog. I already had a name I’d been using for my online family tree and for my Facebook page. I don’t know how many pages of material all of my blog posts cover. This is post #559. Ninety thousand visitors have dropped in and viewed my posts over 168,000 times during these five years. Although the majority of my articles have been about my children’s ancestors, visitors to my blog have been more interested in other content. About Cathy Meder-Dempsey, my “about page” last update in November 2017. Maybe I should refresh it a bit. 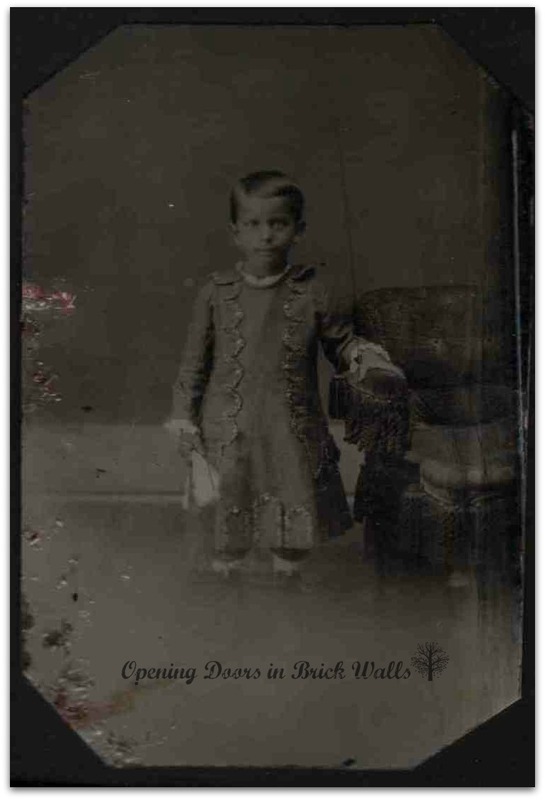 This young man was featured in Old Photographs Saved From Trash Can ~ #36 Otterbein E. PADDACK 1874-1942 on New Year’s Eve 2015 and has gotten the least amount of views of all of my posts. A grand total of 47 views compared to the 1,649 to 2,798 for the top 10 above. With a name like Otterbein Paddack, no wonder he hasn’t been Googled. What brings traffic to my blog if they didn’t drop in by clicking a link shared on social media? Search terms are no longer a precise way of determining what people are searching for as they are often encrypted on the search engines. But the ones which do make the list are fun to look at. The top search term over the years has been the blog name followed by Johnny Cash family tree. Number 3 was Verwurelter. If you don’t know what Verwurelter are then take a moment to read the only recipe post I’ve written: Family Tradition: Berliner and Verwurelter. Luxembourg and German towns names, as well as all those surnames of ancestors, have drawn readers to my blog. One search might not have helped the person interested in a dempsey in prison in beckley wv. It makes me want to do the same search just to find out if there was a Dempsey in prison in Beckley. I’m always willing to solve a puzzle. The person who visited looking for a naughty 50-something mother in the countryside was probably not very impressed when the search criteria turned up: 52 Ancestors: #50 My Naughty Mr. and Mrs. DEMPSEY. As I mentioned in my first post in 2019, I’m taking things as they come this year. I’ll be working on whatever needs to be researched, reviewed, or updated. No resolutions and no promises. Not all of my time is spent researching and writing for my blog. Three years ago the president of my genealogy society, Luxracines, asked if I would be interested in joining the committee. It’s not much work, he said. It was more time consuming than I had thought but I will be offering my candidature for another three years when our annual meeting is held in March. Along with spending time with family and friends, I also have a retired husband who wants to share his passion for cycling with me. He keeps me healthy since research and blogging are sedentary tasks. Riding 5,300 kilometers (3,293 miles) last year took 210 hours and that doesn’t include preparations time and after ride clean-up. And I get my eight hours of sleep at night. And now it’s time to light the candles. 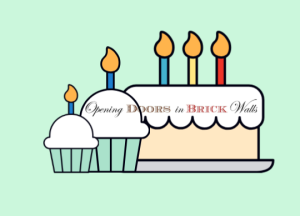 Happy 5th Blogiversary to Opening Doors in Brick Walls. Thanks to all of you for making this such an enjoyable journey. © 2019, copyright Cathy Meder-Dempsey. All rights reserved. Congratulations 5 for your Blogiversary ! Great Work Cathy ! Merci, Rob. It’s been fun and at times a lot of work but look at the results! What a fun look back at 5 years of outstanding blogging. Here’s to the next 5 and the 5 after that! Thank you, Wendy. It helps to have a community supporting me. I still look back on the interview you did with me for GeneaBloggers, now Geneabloggers Tribe, back in my second year. What an awesome accomplishment, Cathy! Your research and writing are gifts to so many. Wishing you a great year in pursuing whatever your heart desires. Who knew I had it in me? It wasn’t easy for this shy person to go public. Thank you, dear sister-in-law. Congratulations on your achievement, Cathy–very impressive! I know how much work it represents. Congrats Cathy! Thank you for taking us on this journey! We’re sure there’s lots more to come. Congratulations on another blogiversary! I sense that you are expecting a lighter year ahead, but for all good reasons. Enjoy!! Why don’t we take this up at the end of the year, Amy. It all depends on how you interpret lighter. Thank you the congrats. By lighter, I meant more time away from the computer and blogging, more time enjoying your family and the outdoors! Happy blogiversary…Sending you all good wishes for your continued genealogy blogging fun and success! Thank you so very much, Marian! Congratulations! Glad to see you online again and I’m looking forward to more family stories. Thank you, Linda. Working on them now. Thank you, Sharon. I really need to read your blog more often. 🙂 I didn’t realize you have another one as well. Congratulations on your five-year anniversary, Cathy. This is a big one. Wishing you continued success in the new year. Here’s hoping Otterbein Paddack enjoys his moment in the sun! Thank you, Michael. I felt kind of bad about Otterbein getting so little views and hope a few will visit his post today. LOL!! “naughty 50-something mother” Creepy to think of who searched for that. Congratulations Cathy, on creating something lasting for your descendants & others . LOL! I actually “talk” to Google when I’m doing searches. It’s a good thing those are encrypted. Thank you, Laura. Happy Bolg Birthday! Keep all the wonderful tips coming. Thank you, Quilting Tangent. I’ll try my best. Congratulations, Cathy! Everything you write is fascinating and instructive to read! I really don’t know how you find time to do everything you do! Congratulations and Happy 5th Blogiversary! That was a fun introduction to a new follower, particularly the least viewed page. Adorable. I think it’s interesting the ones I spent the most time on got the least views. Thank you, Jim. Happy Fifth Blogiversary! Great insight. With the genealogy blogging community we have a great team supporting and helping when we need it. Thank you, Sue. Congratulations! I just had my 6th blogiversary last week. Congratulations to you, Joan, for your 6th blogiversary last week. Thank you. Congratulations! Here’s to the next 5 years! Cathy, Congratulations on your Blogversary! Previous Previous post: I No Longer Need that Lookup, Folks! ThruLines™ Introduced by Ancestry: TrueLines or TrueLies? 52 Ancestors: #52 Levina DOSS - Another Unmarried Mother and How She Helped Me Bring This Challenge Finale to an End with a Bang! Opening Doors in Brick Walls Blog at WordPress.com. As my life goes by, the past gets closer and the future further away. While the process for making photographs may have changed over the years it is still all about capturing light.